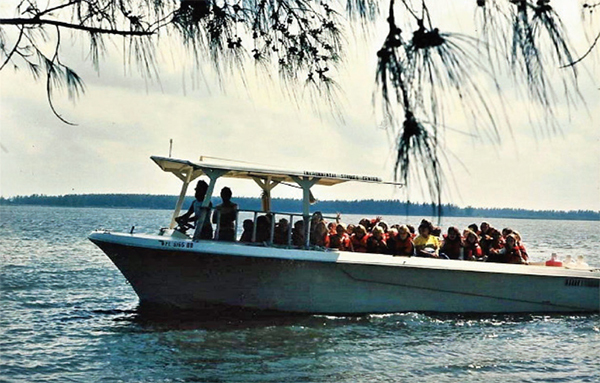 For over 40 years the River Scout has served the Environmental Studies Center and carried more than 100,000 students to give them an experience that no classroom can match. 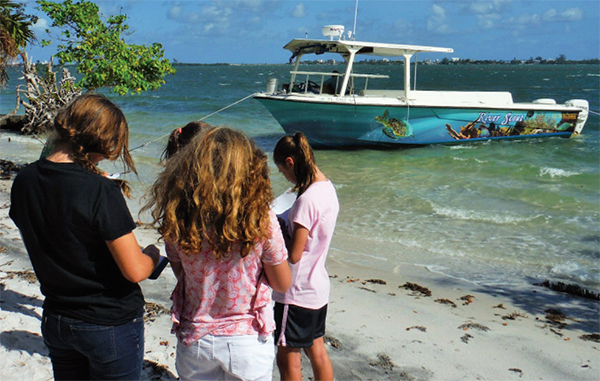 The River Scout provides every fifth and sixth grade Martin County student with access to the Indian River Lagoon. 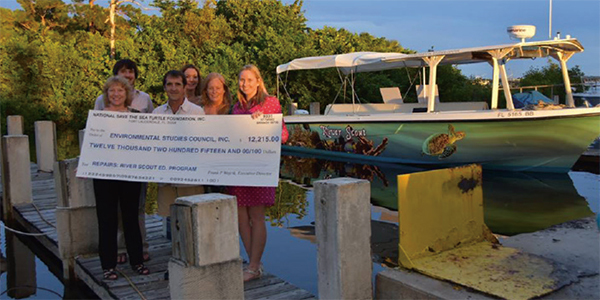 The National Save The Sea Turtle Foundation presented a check for $12,215 to the Environmental Studies Council and Center staff at the River Scout unveiling. and invasive plants on the island and discuss the role each has on the health of the environment. They witness tidal flow in the lagoon and learn about boater safety, channel markers, slow speed zones, boating etiquette, anchoring and docking the boat in a current. Students learn about the animals on and around the island and use seine nets to capture organisms living off the island’s shore. In sixth grade students become marine scientists for the day. They are taught the scientific method and observe, measure, collect, and record data. While aboard the River Scout students complete three stations to learn more about the boat and the marine environment. At the first station students locate their position on nautical charts, learn about GPS coordinates, and how latitude and longitude function. They also us anemometers to record wind speed, learn how to use a handheld compass to take a bearing on fixed objects, and interpret tide charts. At the second station students explore the bottom of the lagoon. Using a sampler claw, students gather and sift through bottom samples and record information about what they’ve found in the sample. At the third station, students examine water quality. Students take water samples and measure salinity using a hydrometer and measure water temperature. Lastly, fine mesh nets are used to collect plankton to examine back at the Center. The River Scout in prep for upgrades. installed. New life jackets were purchased for all the staff and students. Before being put back in the water, the River Scout’s motors were inspected and made ready for the new school year. 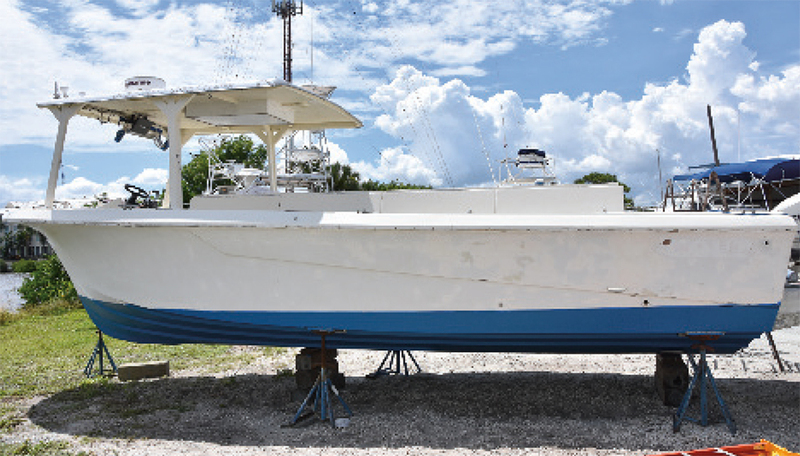 The River Scout was officially unveiled to the Center’s supporters and community partners on September 24th at the Central Marine Services boat yard in Stuart, Florida. It was an opportunity for community partners to see the improvements up close before the boat returned to helping Martin County students explore the lagoon. The new hull wrap and upgraded features have been a big hit with the all of the students and staff. 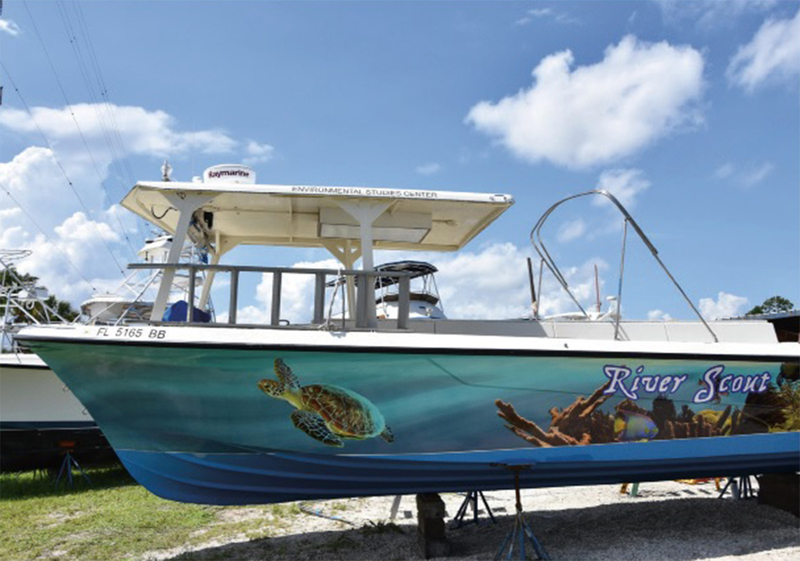 With the support of the National Save the Sea Turtle Foundation the River Scout is ready to ferry the next 100,000 Martin County students across the Indian River Lagoon. Students from Bessey Creek Elementary study the spoil island as the River Scout is anchored just offshore.